Nowadays, viral nanoparticles (VNPs) have attracted a lot of attention, although some are concerned that VNPs may reflect on viral entry of virus into animal or plant cells. In the present study, it aimed to investigate the pathogenesis of VNPs formed by Herceptin (Trastuzumab) and the viral nanoparticles derived from the filamentous plant virus Potato Virus X (PVX-HER) in host plant. Flow cytometry was used to evaluate the toxicity of plant virus alone (free-PVX) in two HER2+ cancer cells and normal cells. Furthermore, the pathogenesis of PVX-HER was tested by ELISA, Western blot, and RT-PCR. The results indicated that PVX-HER failed to cause disease in the host plant. Furthermore, cancer and normal cell lines could evade the apoptosis and necrosis by the free viral nanoparticles (free-PVX). This study suggests that the problem of toxicity considered as a challenging factor in most nanoparticles was not observed in this plant virus nanoparticle. Finally, the safety of the environment was confirmed. The present research is the first study which focused on VNPs based on safety perspective that can be used for drug delivery carriers. Over the last few decades, the use of nanoparticles in drug delivery has been emphasized to optimize the effect of drugs, enable high-specificity targeted delivery, and reduce toxic side effect. Furthermore, the most current nanostructures including dendrimer, micelles, carbon nanotube, inorganic nanoparticles, polymerase, and viral nanoparticles (VNPs) are characterized as the targeted drug delivery (Mody et al. 2014). Nowadays, large types of nanomaterials are being developed. VNPs, as one of the natural bionanomaterials, offer several advantages over the conventional synthetic particles due to self-assembly, biocompatibility, biodegradability, inexpensive, and large-scale production (Yoo et al. 2011). VNPs have been widely developed and used in medicine during the last few years (Aniagyei et al. 2008; Hefferon 2016; Van Kan-Davelaar et al. 2014; Young et al. 2008). VNPs have been genetically and chemically reprogrammed to be used in drug/gene delivery (Campos and Barry 2007; Manchester and Singh 2006; Steinmetz 2013), vaccines (Hefferon 2016; Lee et al. 2016; Peruzzi and Chiocca 2016), and nanomaterials (Lebel et al. 2016; Niu et al. 2007; Rong et al. 2008). VNPs based on plant viruses are extremely advantageous, because they are less likely to interact with mammalian cells and accordingly reduce the unpleasant side effects (Steinmetz 2010). Various types of plant viruses are extensively used for VNPs (Culver et al. 2015; Lico et al. 2015). Although filamentous and rod-shaped VNPs have increased tumor homing properties, most of the studies conducted in nanomedicine application have focused more on spherical plant virus (Biabanikhankahdani et al. 2016; Bruckman et al. 2014; Le et al. 2017; Shukla et al. 2013; Wen et al. 2012). Regarding targeted drug delivery, the use of VNPs in transferring therapeutic products to specific cells to treat cancer and infectious diseases is considered as one of the emerging fields. In addition, these VNPs can significantly contribute to the improvement of medical imaging and more efficiency of vaccination. Progress in this field needs a comprehensive understanding of viruses and loading the drugs. Nevertheless, it is very important to focus on the destructive effects, toxicity of nano-carriers to the body, and environment while emphasizing their use. Potato Virus X (PVX) is more common in growing potatoes on the farms and infects a wide range of plant hosts, especially in Solanaceae family. (King et al. 2011) Some species of PVX cause devastating disease in the fields and it can induce a significant economic loss in synergistic co-infection with some viruses, especially Potyviruses (Bance 1991). PVX is a type member of the plant virus Potexvirus genus and Alphaflexiviridae family. The virus is easily transmitted mechanically. The particles of flexible filamentous virus are about 500 nm long and 15 nm wide. PVX contains a single-stranded positive-sense RNA genome of about 6.4 Kb in length including five open reading frames (ORFs). ORF1 encodes the putative viral RNA-dependent RNA polymerase (RdRp), which is about 166 kDa and has three motifs of methyltransferase, helicase, and replicase (Mentaberry and Orman 1995). ORFs 2–4 are formed as triple gene block, which can encode TGBp1, TGBp2, and TGBp3 for about 25, 12, and 8 kDa, respectively, required for virus cell-to-cell movement (Bayne et al. 2005). The involvement of the CP protein was encoded by ORF5 in a systemic infection to replicate the genome and packaging of the RNA to form complete virus particles was suggested for PVX (Allan Granoff 1999). Breast cancer was regarded as one of the most common types of cancer during 2012. Approximately, 20–30% of the patients with breast cancer are HER2-positive, which is more aggressive than other types of breast cancer (Armuss 2014). Herceptin (Trastuzumab) was approved as an antibody-targeted therapy for breast cancer by FDA. Herceptin is a humanized monoclonal antibody which can prevent from proliferating the cells and transducing the signals (Hudis 2007). Esfandiari et al. reported new isolated of PVX, (Esfandiari et al. 2009) which was conjugated and characterized for the monoclonal antibody Herceptin (PVX-HER). In addition, PVX-HER increased the death of HER2+ breast cancer cells (SKBR3 and SKOV3) in comparison to the free Herceptin (free-HER) (Esfandiari et al. 2016). In the present study, free-PVX (PVX that is not conjugated with Herceptin) was used to evaluate the toxicity of the plant virus alone as a VNP on two cancer cell lines and non-tumorigenic epithelial breast cell line (MCF-12A) as a normal cell. Accordingly, the cells were examined using flow cytometry after 24 h. Furthermore, all PVX-HER conjugation stages were conducted on the virus leading to the creation of PVX–PVX particles. In the next procedure, the produced particle was made to interact with SKBR3, SKOV3, and MCF-12A by flow cytometry. Finally, the pathogenicity of this PVX-HER nanoparticle was investigated in Nicotiana benthamiana as one of the indicator plants of PVX indicator plants of PVX. For this purpose, serological and molecular analyses were employed to detect PVX in inoculated N. benthamiana by ELISA, Western blot, and RT-PCR. A large number of plant viruses can successfully infect N. benthamiana, as one of the most widely used experimental hosts in plant virology. In addition, N. benthamiana is gaining popularity in plant viral purification and large quantities of protein both rapidly and economically (Goodin et al. 2008). PVX is also able to establish infection in N. benthamiana (Aguilar et al. 2015). Thus, to investigate the large-scale purified virus, PVX used for inoculation of N. benthamiana in phosphate buffer (pH 7.2). Then, the leaves were harvested and purified within 2–3 weeks after inoculation of N. benthamiana (Senanayake and Mandal 2014). Accordingly, 100 g of the leaves were homogenized with 0.1-M phosphate buffer. Furthermore, the leaves were centrifuged at 7800g for 20 min after filtration with cheesecloth. 0.02-M NaCl and 4% PEG were added to the supernatant and centrifuged at 7800g for 30 min. The pellet was suspended in 1% Triton X-100 and 0.05-M phosphate buffer and centrifuged at 7800g for 10 min. In the next procedure, the supernatant was centrifuged in 30% sucrose gradient at 72,500g for 150 min using ultracentrifuged Backman Ti 70 rotor (Salazar 1993). Finally, the pellet was suspended in phosphate buffer (0.05 M, pH 7.2). Furthermore, the purity of virus was confirmed by SDS-PAGE and UV/Vis spectroscopy. To obtain PVX-Herceptin nanoparticle (PVX-HER), EDC/sulfo-NHS (1:2.5) was used to conjugate Herceptin (IV infusion) to PVX (Esfandiari et al. 2016). In addition, EDC/sulfo-NHS cross linker was used to conjugate PVX–PVX during a two-step process. First, PVX (5 µg/µl) was incubated with EDC/sulfo-NHS (2 mM/10 mM) for 4 h, and accordingly, PVX-linker and another PVX particle (5 µg/µl) were conjugated for 2 h. Furthermore, free-PVX was purified virus without any conjugation. To study the pathogenicity of PVX-HER on plants, N. benthamiana plants as a PVX indicator were set up in three rows and each row contained 12 plants. Next, plants inoculated with PVX-HER nanoparticle and PVX (as a positive control) in a buffered solution containing 0.05-M phosphate buffer pH 7.2, 2% PVP (Esfandiari et al. 2006). The development of symptoms on the plants was observed after 3 weeks (Senanayake and Mandal 2014; Zhao et al. 2001). The virus accumulation increased at 21-day post-inoculation with PVX (Senanayake and Mandal 2014). Accordingly, leaves of N. benthamiana 3 weeks after inoculation with PVX-HER, free-PVX, and healthy plant as a negative control were tested by sandwich ELISA assay in 96-well plates (Nunk Denmark). Each well was coated with PVX-specific antibodies (DSMZ, PV-0027) diluted in coating buffer. Then, the samples were prepared in PBST buffer, pH 7.4 (containing 2% PVP) added to the well and incubated at 37 °C overnight. In addition, the secondary antibody (Goat–anti-rabbit IgG-HRP, ab6721) was diluted and added to each well. After washing the plate three times with PBST buffer pH 7.4, 100 µl of TMB solution (3, 3′, 5, 5′-tetramethylbenzidine, T0565 Sigma) was added to each well and incubated for 15 min at the room temperature. The reaction was stopped by 100 µl/well of stopping solution. Then, the absorbance was read at 450 nm using ELISA reader (ELX 800, Biotek). PVX-HER, free-PVX, and negative control should be performed in triplicate. The leaves of N. benthamiana were separately inoculated with PVX-HER and free-PVX. After 3 weeks, the leaves were extracted in 0.05-M phosphate buffer pH: 7.2 and boiled for 5 min. The boiled samples were loaded into 4–12% acrylamide gels electrophoresis. PVX-HER, free-PVX, positive control (purified PVX), negative control (without inoculating healthy N. benthamiana leaves), and a protein marker (prestained protein ladder, Thermo; 2616) were run at 100 V for 45 min. Then, proteins were transferred into nitrocellulose membrane at 350 mA for 90 min. After blocking in 4% nonfat dry milk in 37 °C for 2 h, the PVDF membrane was blotted by PVX antibody (DSMZ, PV-0027) at 4 °C overnight. After washing the membrane with PBST buffer, it was incubated with goat polyclonal secondary antibody to rabbit IgG-HRP (Abcam ab6721) for 2 h. In the next procedure, ECL chemiluminescent substrate kit (GE Healthcare, Advance Western Blotting Detection Kit, RPN 2235) was used to detect the visualized protein bands. Finally, PVX-HER, free-PVX, positive control, and negative control were compared to each other. Total RNA was isolated from 100-mg infected leaves at N. benthamiana 14-day post-inoculation with PVX-HER, free-PVX, and healthy plant (non-inoculated as a negative control) by RNeasy plant mini kit (Qiagen RNeasy Plant Mini Kit (cat#74904)). The cDNA of RNA virus was synthesized using M-MuLV reverse transcriptase (200 U/µl), total RNAs, and the reverse specific primer. This reaction was incubated at 42 °C for 1 h.
In addition, the cDNA synthesized was applied in the PCR reaction containing 0.1-M cDNA, 2.5-µl 10× PCR buffer, 1-µl dNTP (10 mM), 0.8-µl MgCl2 (50 mM), 0.3 µl of each specific primer (forward and reverse 20 pM), 0.3-µl Taq DNA polymerase (Promega), as well as 19.7 µl of DEPC-treated water. The PCR reaction condition occurred at 94 °C for 1 min, followed by 35 cycles of 94 °C for 1 min, 55 °C for 1 min, and 72 °C for 1 min, with a final extension step of 72 °C for 1 min. The PCR products were analyzed by 1.5% agarose gel electrophoresis including 0.5% µl/ml ethidium bromide, and visualized by ultraviolet transilluminator (UVP). The forward primer: 5′-AAGATGTCAGCACCAGCTAG-3′ and reverse primer 5′-GTAGGCGTCGGTTATGTAGA-3′. Tumor cell lines and MCF-12A non-tumorigenic epithelial breast cell line were implemented to study the toxicity of free-PVX, PVX–PVX, and free-HER. Accordingly, SKBR3 (2 × 105), SKOV3 (1 × 105), and MCF-12A (1 × 105) cells were seeded on a 12-well plate at 37 °C in a humidified atmosphere containing 5% CO2 incubator. SKBR3 and SKOV3 cells were grown in RPMI-1640, and MCF-12A was cultured in DMEM. The growth media were supplemented with 10% FBS (fetal bovine serum), penicillin, and streptomycin 10 μg of free-HER, free-PVX, and PVX–PVX were added on a 12-well plate for each cell, separately. At 24 h after the treatment, the cells were collected by trypsinization into their culture media, washed with PBS, and stained with Annexin V/propidium iodide (PI) Kit (BMS500 FI/100, eBioscience).The Annexin V/PI assay was conducted to determine cell apoptosis. In the next stage, the cells were analyzed after 10-min incubation by FACScan flow cytometer. Finally, Annexin V-binding and PI-binding were recognized to be apoptotic and necrotic, respectively. It is worth noting that all measurements were performed in triplicate. To analyze the data, Mean ± SEM along with analysis of variance (ANOVA) with LSD post hoc test were used by SPSS 16.0 software. Before performing the parametric tests, normality distribution of the data sets was tested by Kolmogorov–Smimov and Shapiro–Wilk tests. The difference in values was considered as significant if the P value was less than 0.001. All experiments were performed in a triplicate and repeated at least three times. In this study, PVX particles were purified from systemically infected N. benthamiana leaves. The PVX was produced at the yields of 0.5–0.1-mg pure virus from 1-g infected plants. The concentration of PVX in plant extract was determined by UV–visible spectrometer (2.97 mg−1 ml−1 cm−1). SDS-PAGE and purity assessment of PVX were determined by a single protein band (27 kDa) and A260:280 ratio of 1.2, respectively. Recently, the conjugation of PVX to Herceptin (PVX-HER) was confirmed (Esfandiari et al. 2016). In the present study, the pathogenicity of PVX-HER in the plants was investigated by mechanical inoculation, ELISA, Western blot, and RT-PCR. The mechanical inoculation of PVX-HER in N. benthamiana was inconsistent with the symptoms in the indicator plants. ELISA assay was set up to evaluate PVX detection in the extract samples from N. benthamiana inoculated with PVX-HER, free-PVX, and negative control. PVX antibody was employed to detect the virus infected samples. The 69% confidence intervals for the absorption mean (Mean ± SEM) in PVX-HER, free-PVX, and control were 0.207% ± 0.068, 3.66% ± 0.014, and 0.198% ± 0.008, respectively. In addition, the absorption of PVX-HER was not significantly different, compared to the control (P = 0.570). In addition, free-PVX could significantly increase the absorbance level compared to the PVX-HER and negative control (P ≤ 0.001) (Fig. 1). Another approach used for confirming the non-pathogenicity of PVX-HER nanoparticle was obtained by SDS-PAGE and Western blotting. An equal amount of PVX-HER, free-PVX, and positive (purified PVX) and negative (healthy plant) control was separated by 4–12% acrylamide gels and transferred to a nitrocellulose membrane. 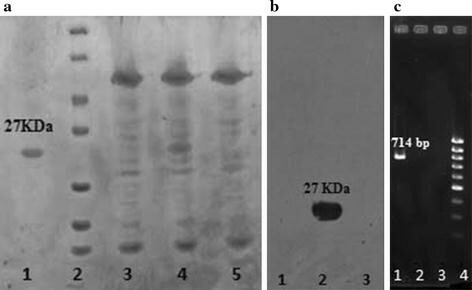 After staining, a 27-kDa molecular weight coat protein of free-PVX was observed, but no 27-kDa band was shown for the extraction of N. benthamiana inoculated with PVX-HER as well as negative control (Fig. 2a). Furthermore, the protein was recognized by PVX-specific antibody. The Western blot analysis of nitrocellulose membrane exposed to PVX-specific antibody in free-PVX indicated a protein band with molecular weight of 27 kDa, while no band was observed in PVX-HER (Fig. 2b). Another important assay to study the samples was performed by RT-PCR. Polymerase chain reaction was used to evaluate the pathogenicity of these samples in the plants. RT-PCR amplification was obtained using specific primers. A fragment 714 bp was obtained to extract N. benthamiana inoculated with free-PVX, while no specific band was observed in N. benthamiana inoculated with PVX-HER (Fig. 2c). The present study aimed to see whether PVX alone (free-PVX) and PVX conjugated to PVX (PVX–PVX) had any cytotoxicity in breast cancer (SKOV3 and SKBR3) and normal breast (MCF-12A). To this aim, 10 μg of free-HER, free-PVX, and PVX–PVX were treated in SKBR3, SKOV3, and MCF-12A cells in 24 h. Annexin V is a calcium-depending binding to phospholipids on the cell membrane. PI which cannot penetrate the intact membrane is used to differentiate between early apoptotic, late apoptotic, and necrotic cells. The ratio of apoptotic SKBR3 and SKOV3 cells decreased after treatment with free-PVX and PVX–PVX, compared to free-HER (Fig. 3). In addition, MCF-12A was not significantly influenced when treated with free-PVX, PVX–PVX, and free-HER, compared to the control sample. For statistical analysis, the one-way analysis of variance (ANOVA) was performed on data related to the control, free-PVX, PVX–PVX, and free-HER. The change in apoptosis was considered as significant if the P value was less than 0.001 after using LSD post hoc tests. The average percentages of apoptotic SKBR3 cells in free-PVX, PVX–PVX, free-HER, and control were 1.282% ± 0.015, 1.193% ± 0.020, 24.393% ± 0.171, and 0.988% ± 0.018, respectively (Fig. 4a). Regarding SKOV3 treatment with free-PVX, PVX–PVX, free-HER, and control, the average percentages of apoptotic cells equaled to 0.994% ± 0.018, 1.194% ± 0.048, 22.10% ± 0.377, and 0.718% ± 0.013, respectively (Fig. 4b). Finally, the average percentages of MCF-12A cell apoptosis indicated 1.177% ± 0.042, 1.176% ± 0.045, 1.178% ± 0.033, and 1.175% ± 0.057 for control, free-PVX, PVX–PVX, free-HER, and control, respectively (Fig. 4c). In addition, SKOV3, SKBR3, and MCF-12A necrotic cells induced by free-PVX and PVX-HER were not induced. The increasing demands on nanotechnology have created some challenges regarding the potential risks of nanoparticles for human health and the environment. A few studies have addressed the toxicity of nanoparticles on bacteria, plants, and animals. Hence, it is necessary to study the toxicity of nanoparticles. Since viruses are self-assembled (Wen et al. 2012), stabilized (Steinmetz 2010), and biodegradable (Singh et al. 2007), they are expected to be good candidates as drug carriers. Researchers have addressed different uses for these carriers by non-pathogenic viruses. (Barwal et al. 2016; Grasso and Santi 2010; Lizotte et al. 2016; Love et al. 2014; Walker et al. 2011). As it was already mentioned, plant viruses are obviously preferred over other animal viruses as they are non-infectious in humans (Steinmetz 2010). Therefore, plant virus nanoparticles are regarded as attractive platforms in nanobiotechnology. The plant virus capsids involve two kinds of structures including helical and icosahedral symmetry. In helical capsids, the protein subunits are arranged in a helix around the viral RNA, while the subunits are assembled in the form of quasi-spherical structure covering the genome in icosahedral symmetry (Caspar and Klug 1962). In the present study, a filamentous virus was used due to some advantages to isometric viruses, although most plant viruses employed for drug carriers are isometric (Esfandiari et al. 2016). In general, interior, exterior, and interface methods are used for loading drug. The exterior surface plays an important role in conjugation with drugs. The conjugation is accomplished by amine, carboxylic acid, and thiol groups (de la Escosura et al. 2009). Accordingly, carboxyl group of heavy chains of Herceptin was conjugated to amine group of PVX nanoparticles by EDC/sulfo-NHS cross linker. In fact, Herceptin is a drug used for treating some breast cancer patients. However, Herceptin is extremely expensive drug with a wide range of unpleasant side effects. The conjugation of Herceptin to nanoparticles can enhanced the efficacy and reduce dosage and side effects among breast cancer patients (Esfandiari et al. 2016). Based on the previous study, PVX nanoparticles, as the result of conjugation of PVX to Herceptin (PVX-HER), could significantly increase the death rate of cancer cells (Esfandiari 2013; Esfandiari et al. 2016). VNPs have been studied from a different environmental perspective, which is regarded as the big concern in using viruses as nanoparticles. A question raised here is whether PVX-HER infects plants or in other words, the conjugation of Herceptin to the exterior of plant virus can create harmful environmental effects. In addition, as another question, the present study aimed to see whether free-HER and PVX–PVX can have toxicity on animal cell lines. PVX is considered as one of the important viral pathogens in many plants, and it is extremely easy to transmit mechanically in the field by contacting with a healthy and infected leaves. Thus, this study could contribute to investigate the pathogenesis of PVX-HER nanoparticle in plants by mechanical inoculation of symptoms on N. benthamiana, which is the main host of the virus. After 3 weeks, free-PVX caused mosaic symptoms on N. benthamiana, while PVX-HER had no symptoms in this plant simultaneously. The molecular and serological testing methods were employed to detect the virus to ensure the non-pathogenicity of PVX-HER. ELISA is the first screening test which is widely used to investigate PVX-HER in inoculated N. benthamiana. In this method, PVX-specific antibodies were used as a capture, and accordingly, goat polyclonal secondary antibody was added. Thus, this test could detect the samples including free-PVX, while negative results were obtained for the extracts of the inoculated N. benthamiana leaves with PVX-HER. In addition, a significance difference was obtained between free-PVX and PVX-HER (P ≤ 0.001). Then, SDS-PAGE was employed to extract the inoculated N. benthamiana leaves with PVX-HER. The weight of coat protein of purified PVX and free-PVX from N. benthamiana equaled to 27 kDa, although no band was observed in the inoculated N. benthamiana PVX-HER, compared to free-PVX. The Western blot was used to confirm the findings of SDS-PAGE by PVX-specific antibody. Western blot was able to identify a specific 27-kDa coat protein band of purified PVX. Furthermore, no band was shown in the inoculated leaves of N. benthamiana with PVX-HER. Finally, reverse transcription PCR (RT-PCR) was utilized to obtain more accurate evaluation results. For this purpose, the nucleic acid of the inoculated N. benthamiana with PVX-HER, the inoculated N. benthamiana with free-PVX, and healthy N. benthamiana were extracted. Then, PVX CP-specific primers were employed to amplify the PVX CP gene. The inoculated plant with free-PVX from genomic nucleic acid including the PVX CP gene with the primers was amplified in a 712-bp product. Based on the results, the inoculated N. benthamiana with PVX-HER RNA yielded no PCR products, which confirmed that the conjugation of the PVX with Herceptin could cause the virus loses its infectivity. In other words, pathogenesis does not take place in plants which are considered as a host of this virus after conjugating PVX to Herceptin. Based on this hypothesis, virus particles lose their pathogenesis after the drug conjugates to the exterior surface of virus capsid. In other words, conjugating Herceptin to the PVX surface using EDC/Sulfo-NHS linker can inhibit disassembly, which is regarded as important for replicating and infecting virus. Based on the results of ELISA, Western blot, and RT-PCR tests, RNA genome replication of the virus could lose its replication after conjugating and creating PVX-HER nanoparticle. Regarding the results of present study, the use of VNPs for conjugating drugs or chemicals to the exterior surface of the VNPs can cause the viral nucleic acid to lose its activity and the pathogenicity in plants. To our knowledge, since the same survey has not been conducted so far and the perspective of environmental pollution of VNPs has not been investigated yet, so there is a great potential to follow research in this subject. Regarding the second question, the previous studies demonstrated that PVX-HER was more effective than free-HER in cell apoptosis and necrosis in the human HER2+ breast cancer cell lines (Esfandiari et al. 2016). The present study aimed to investigate the effect of PVX-HER nanoparticle on the plants and influence of free-PVX on human cells. In addition, the self-conjugate PVX (PVX–PVX) was used. In fact, the goal was to determine whether the PVX-HER initiated toxicity in cells is under the influence of PVX nanoparticles or possibly due to chemical compounds used in the conjugation process. For this purpose, the effect of nanoparticle HER-PVX, PVX–PVX, and free-PVX on HER2-positive cell lines (SKOV3-SKBR3) and non-tumorigenic epithelial breast cell line was examined by flow cytometry. It was observed that, in average, no significant difference was observed in apoptosis between PVX–PVX, free-PVX, and control in SKOV3 and SKBR3 cell lines after 24 h (P ≥ 0.001). Furthermore, no significant difference was reported in normal cells, treated with PVX–PVX, free-PVX, free-HER, and control after 24 h (P ≥ 0.001). Therefore, the toxicity of PVX-HER nanoparticle on HER2-positive cell lines is not related to a direct effect of this plant virus on human cells, while it is more concerned with the delivering the controlled drug and releasing Herceptin to target cells after binding to the virus and generating PVX-HER nanoparticle. In conclusion, the present study indicated that PVX-HER nanoparticles are not non-pathogenic to their host plants and free-PVX is not toxic to human cell lines. In recent years, viral nanoparticles have attracted a lot of attention. In this area, a large body of research has been conducted. However, the present study has opened a new dimension into this field. The results demonstrate that viral nanoparticles are not toxic and they are safe for organism and environment. Finally, VNP is expected to be revolutionized in many different fields such as agricultural, medical, and industrial sectors during the next few years. NE designed and performed experiments, prepared figures, and wrote the main text. MK and MKH contributed with valuable discussions. All authors reviewed the manuscript. All authors read and approved the final manuscript. The research of Neda Esfandiari was in part supported by a grant from Shahid Beheshti University, G.C. (No. 600/1312). The authors are grateful to Dr. Alireza Taheriyoun for his fruitful statistical discussion. Moreover, they are very grateful for the useful comments provided by the three reviewers. The research of Neda Esfandiari was in part supported by a grant from Shahid Beheshti University, G.C. (No. 600/1312). Springer Nature remains neutral with regard to jurisdictional claims in the published maps and institutional affiliations.